The XR accounted for 39 percent of sales, beating out a combined 26 percent for the XS and XS Max, said Consumer Intelligence Research Partners. The XR was only launched on Oct. 26, partway through the quarter. 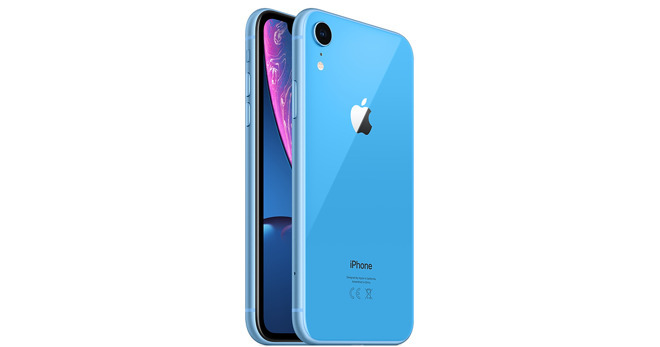 Apple has repeatedly said that the XR has topped iPhone sales every week since its launch, without offering precise percentages or unit numbers. The phone was widely expected to beat the XS line, thanks to a cheaper $749 pricetag while sharing features like an edge-to-edge display, Face ID, and an A12 processor. Its sacrifices include OLED technology and a second rear-facing camera sensor. Some analysts have argued though that even the XR hasn't sold as well as expected, apparently backed by rumors of production cuts, and Apple's own guidance to a $5 billion shortfall that it blamed mostly on weak Chinese iPhone sales. CIRP tangentially noted that the XS Max outsold the standard XS by a ratio of over 2 to 1. The Max costs at least $1,099 -- but its 6.5-inch screen may have been enough of an upgrade to entice people who would otherwise have skipped 2018 hardware. CIRP data has been questionable in the past. In the same quarter a year ago it calculated that the iPhone 8 outsold the iPhone X, despite Apple at one point saying the X was outdoing other models on a weekly basis. It maybe that data was skewed by the timing of the X launch, since the iPhone 8 shipped in September 2017 and the X only arrived in November. Don't doubt. XR is better value in all respect. Reflects the trend on how buyers buy products. Some price conscious(XR), some want the best(XS MAX) and rest want balanced in-between(XS). But but iPhone XR isn't selling so this good news means XS/XS Max are selling even LESS!! Yes I said the XR would not sell so Apple is a fails, but now that I've been disproven, XS isn't selling so Apple is a failz!! This doesn't disprove any of that. All it's saying, a surprise to no one, is that the Xr is the best selling of the iPhone launched last fall. It doesn't indicate what overall sales are, and many things (including Apple's own guidance revision) clearly indicate overall iPhone sales softening. And yet Apple will be reporting their second best quarter. Go fig. It's odd for me to see the XR and XS Max selling so well, when for me, even the XS is too large for me. Wish apple would release a SE sized full screen phone with modern hardware and slot it in around $650. In a world where the smartphone is the only computer for the majority of users, it is not odd at all. And this is not a knock on those prefer smaller size smartphones. This is just where the market is heading. Goes back to what I said in another thread - they are merely comparing to phones introduced this year, of which the XR sells better than the XS or XS Max. Notice how there are no more comparisons to prior year sales - which used to be, always, 50% higher than the previous year, driven by premium model upgrades. A significant number of iPhone users are eithe returning their X model iPhones (based on lack of Home Button - roughly 20%), or not bothering to upgrade (because Apple has priced the new models too high. Again, if the X models actually delivered the same functionality AND more, most people would stay in line, or not return them - but as Apple has provided a user interface regression by removing the Home Button completely, AND has priced these models too high, they are seeing this significant drop in sales, in their premium and upgrade segments. Publicly, Apple will keep pointing at external factors, because Apple will never admit to have been wrong - that’s fine, that’s just their public stance. Internally, Apple leadership knows fully well they screwed up, and in a big way - the question is just how will they address this, and fix it? The easiest way is to introduce a fixed, virtual home button (which is what they had planned all along anyways), by beefing up Assistive Touch with a UI API that forces a dedicated location for the Home Button, in the center of the bottom. Easy to do. It’d be like a notch, except in software, so it can move out of the way (visually) when in full-screen horizontal mode (like viewing video). This is would be extremely easy to implement, and what The Old Apple would have done, under Steve, beginning with the iPhone X. Now, by re-introducing the Home Button (and then can keep the gestures, despite being blatantly stolen from Android, which uses the exact same gestures), and performing impressive theatric by introducing “There’s No Place Like Home”, they would effectively turn this around, and get a huge number of customer that are ‘on hold’ to whip out their credit cards - because this sort of software fix would make all the existing models usable to the demographic currently holding back. Future iPhone models would have a slight depression in the glass, or an etched circle, where the Home Button would be located. It would be an easy fix, in software, and the only thing standing in the way are internal, personal politics. Intel just reported earnings. Down 6% after hours due to weak outlook. Also said modem revenue was $200M less than expected. Prices have gone up on pretty much all Apple hardware so no suprprise a record quarter for revenues. What is your source for the bolded items? This doesn't disprove any of that. All it's saying, a surprise to no one, is that the Xr is the best selling of the iPhone launched last fall. If it is true that this surprises no one, then last year's X selling more than the 8 is extra noteworthy, since price wasn't the primary driver. Since Apple has all the sales data, I have to believe the SE form factor didnt sell as well as the bloggers and commenters wish it had. Jobs on why they discontinued the Xserve: "Hardly anyone was buying them." Yes, please cite your data. We've been reading every article on this site for years and don't recall those stories. The X outsold the 8 every single week it was available. That is indisputable fact, as explained clearly by Cook. The market spoke. As for your Home Button fantasies -- never gonna happen, my guy. Sorry. Change is hard, but once you decide to embrace it you will get better, I promise. I don't want a phone bigger than the SE, but if the Xr were the size of the X/Xs, I might have caved. But the SE will last me about 5yrs or until the OS is no longer supported. I’m not surprised. Many people have said that the Xr is the best value. Slightly worse camera, slightly worse screen (that most people won’t notice,) but otherwise substantially the same hardware as the Xs. Historically, Apple comes out with a new model with better specs and discounts the previous year’s model. This year, they came out with the Xs, discontinued the X and introduced the Xr with largely the same specs. If you’re Ok with the differences, you have a phone that will perform well just as long as the top of the line model for $200 less. Pretty easy choice. This can be interpreted in many ways. Maybe it’s strictly price driven because people don’t want to pay $1000 for their phone. It may simply be a value decision for the reasons listed above and people are buying the Xs Max because the larger screen is worth it for them despite the price. Maybe it’s a combination of the two. I bought my XR two weeks ago, and I couldn’t be happier with it. It’s a huge jump up from my trusty old 5s. One of my complaints about the bigger phones (aside from pocket-fit) is the balance in my hand. Maybe I'd learn to hold it in a new way, but I get the sense that these popsocket things are a bit of bandage to compensate for what I've felt as a "top heavy" balance that always makes me feel like the phone will fall out of my hand. I thought the same things but honestly I got used to the larger XR rather quickly, and it fits into my pocket just fine, even with an otterbox case on it. I don’t think I could go back to a smaller phone now.